With its balmy winter climate and idyllic setting, Aqaba is Jordans year-round aquatic playground. In winter, while Amman shivers around 5ºC (41ºF), the temperature hovers steadily at about 25ºC (77ºF) in Aqaba. The thriving underwater marine life and the crystal clear waters of the Gulf of Aqaba make diving conditions there among the acknowledged best in the world. Snorkeling, water skiing, windsurfing, fishing and other water sports are also popular. For the history enthusiast, Aqaba contains sites reflecting human habitation back to 4000 BCE, resulting from the citys strategic location at the junction of trading routes between Asia, Africa and Europe. According to the Bible, "King Solomon also built ships in Ezion-Geber, which is near Elath in Edom, on the shores of the Red Sea." This verse from the Old Testament (1 Kings 9: 26) probably refers to an Iron Age port city on the same ground as modern Aqaba. The name Elath refers to the Israeli town of Eilat. The Queen of Sheba (ancient Yemen) traveled from Jerusalem to the port city of Ezion Geber to visit the splendorous court of King Solomon in the tenth century BCE (1 Kings 10: 1-13). The remains of what is believed to be the oldest church in the world, Aqaba. © Michelle Woodward In one of the most exciting discoveries in recent times, archeologists working in Aqaba have unearthed what they believe to be the worlds oldest church. Dating from the late third century CE, the 26 x 16 meters structure is thought to be the oldest building built specifically as a church. It is slightly older than the Church of the Holy Sepulchre in Jerusalem, and the Church of the Nativity in Bethlehem, both of which date from the fourth century. The church is found on a plot of land east of Istiqlal Street, near the parking lot of the JETT bus station. Trading routes developed connecting Aqaba with southern Arabia and Yemen, and the town grew into a thriving city. The Nabateans populated the region extensively, drawn by the strategic trading location of Aqaba. In Roman times, the great Via Nova Triana came down from Damascus through Amman to Aqaba, where it connected with a west road leading to Palestine and Egypt. 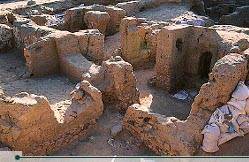 The early days of the Islamic era saw the construction of the city of Ayla, which was described by the geographer Shams Eddin Muqaddasi as situated next to the true settlement, which was lying in ruins closeby. The ruins of Ayla, unearthed in the mid-1980s by a American-Jordanian archeological team, are a few minutes walk north along the main waterfront road. The Crusaders occupied the area in the 12th century and built their fortress of Helim, which remains relatively well-preserved today. The Aqaba fort was rebuilt in the 14th century under one of the last Mamluk sultans, Qansah al-Ghouri, and has been substantially altered several times since then. The Hashemite Coat of Arms was placed above the main doorway during the Great Arab Revolt of World War I, after the Turks were driven out of the city. The fort is open daily and entrance is free. In addition to building a stronghold within Aqaba, the Crusaders fortified the small island of Ile de Graye, now known as Pharoahs Island, about seven kilometers offshore. The island, which is now in Egyptian territorial waters, can be reached via tour excursions which leave from the Aquamarina Hotel. 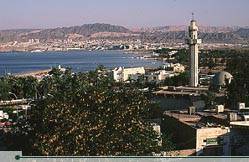 By 1170, both Aqaba and the island had been conquered by Salah Eddin. The Mamluks took over in 1250, but by the beginning of the sixth century they had been overtaken by the Ottoman Empire. The city then declined in status, and for 400 years or so it remained a simple fishing village of little significance. During World War I, however, Ottoman forces were forced to withdraw from the town after a raid by Lawrence of Arabia and the Arab forces of Sharif Hussein. The capture of Aqaba helped open supply lines from Egypt up to Arab and British forces afield further north in Transjordan and Palestine. In 1965, King Hussein traded 6000 square kilometers of Jordanian desert to Saudi Arabia for another 12 kilometers of prime coastline to the south of Aqaba. This gave Jordans only port room to expand and added the magnificent Yamanieh coral reef to the Kingdoms list of treasures. With its tranquil, clear waters and thriving marine populations, Aqaba is ideal for divers as well as casual water sports enthusiasts. As the Gulf of Aqaba is an inland sea with few strong currents, its waters remain warm and clear throughout most of the year. Conditions are ideal for underwater photography, and a lavish array of exotic fish and plant life makes for excellent snorkeling and diving. Over 140 species of coral have been identified in Aqabas waters. There are several diving centers in Aqaba, the most prominent of which are the Aquamarina I Hotel (tel. 03-201-6275), the government-run Royal Diving Center (tel. 03-201-7035), and the Seastar Watersports Center in the Al-Cazar Hotel (tel. 03-201-4131). The Aquamarina I also offers a number of other aquatic activities, including windsurfing, waterskiing, and, for the less adventurous, paddle-boats. A new diving area is being developed near the Saudi border near the world-famous Yamanieh coral reef. This complex, known as the South Coast, will have an assortment of hotels, parks, restaurants and watersport facilities. For up-to-date information on where to go to enjoy your favorite aquatic activities in Aqaba, the Aqaba Visitors Center (tel. 03-201-3731) is located behind the Aqaba fort by the waterfront. The office is open daily from 08:00 to 16:00, and closed on Tuesday. Located in back of the Visitors Center, the Aqaba Museum displays a number of exhibits and plenty of information on the old city. The museum was once home to Sharif Hussein bin Ali, great-grandfather of King Hussein. Stunning in its natural beauty, Wadi Rum epitomizes the romance of the desert. With its "moonscape" of ancient valleys and towering sandstone mountains rising out of the sand, Wadi Rum is also home to several Bedouin tribes who live in scattered camps throughout the area. 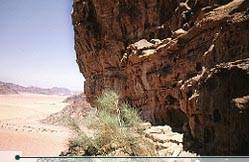 Climbers are especially attracted to Wadi Rum because of its sheer granite and sandstone cliffs, while hikers enjoy its vast empty spaces. Wadi Rum is probably best known because of its connection with the enigmatic British officer T.E. Lawrence, who was based here during the Great Arab Revolt of 1917-18. Much of David Leans Lawrence of Arabia was filmed in Wadi Rum. For those with a bit more time and/or sense of adventure, the best way to see Wadi Rum is by hiking and camping in it. Indeed, the vast silence and grandeur of the landscape is best experienced on foot. All you need for hiking in Wadi Rum is plenty of water (at least 2-3 liters per day), some food, good shoes and a sleeping bag. Those with a four-wheel drive, a map and plenty of fuel can see more of the landscape, while saving their energy for spectacular hikes such as the Rock Bridge of Burdah, one of Wadi Rums most popular attractions. Offroaders should exercise care in staying on the tracks to avoid plowing over desert vegetation. Dont venture too far away from Rum, and remember to bring plenty of water. Highly recommended for adventure-seekers are Tony Howard's detailed Treks and Climbs in the Mountains of Wadi Rum & Petra or the less extensive Walks & Scrambles in Rum.